I was involved in a car accident and the insurance company is giving me the run around. What should I do? Since 2011, California has enacted the Admin Per Se law which lets the state immediately suspend your driver’s license. It is confiscated and sent to the DMV where it will be held until the suspension period has ended or the charge has been dropped. If you are 21 years or older, at 0.08% blood alcohol content it is considered illegal. Merely operating a vehicle, it can not be higher than 0.04%, and if the person driving is younger than 21, the amount is 0.01% or higher. The state DUI law also includes medications as well. Cough syrup, prescription medication and over the counter medication that have adverse effects, all count as a DUI in the state of California. If you refuse to take a chemical test you can then be subject to penalties. The first offense is a 1-year suspension, the second offense is a revocation of 2 years, and the third offense is a revocation of 3 years. For those who are 21 and older there are additional penalties attached to each number of offenses. 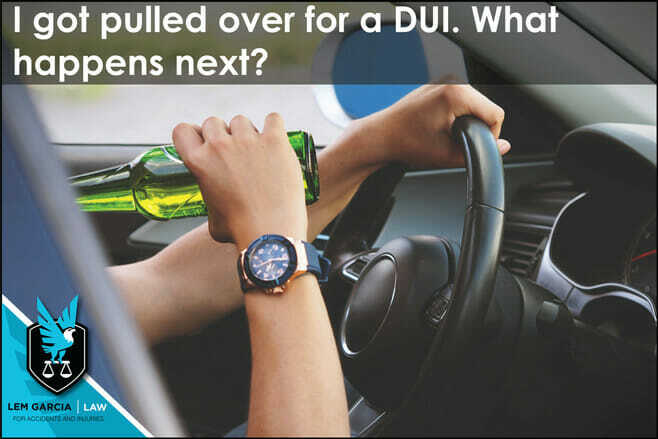 For the first offense there is up to 6 months in jail, $1000+ in fines, the $125 fee to have the license reissued, SR-22 filing and a DUI program. The length of the DUI program is dictated by the amount of blood alcohol content at the time of the arrest. West Covina car accident attorney, Lem Garcia, helps people who have been injured in car collisions recover as much as possible from the person who is at fault. If you were recently involved in car crash involving a drunk driver, it is important that you speak to an experienced personal injury lawyer right away to find out what you can do to make sure that you are taken care of.